Back a little over a year ago I wrote about this wine: "Blown away right from the start. I enjoyed the balance of the wine. Subtle oak, minerality and rich but refined fruit. not sure you could ask for more." Recently, after having the wine once again I commented: "Beautiful Chardonnay. Full and rich. Subtle oak nuances with fruit dancing in the glass. Impeccably balanced. A favorite of mine." 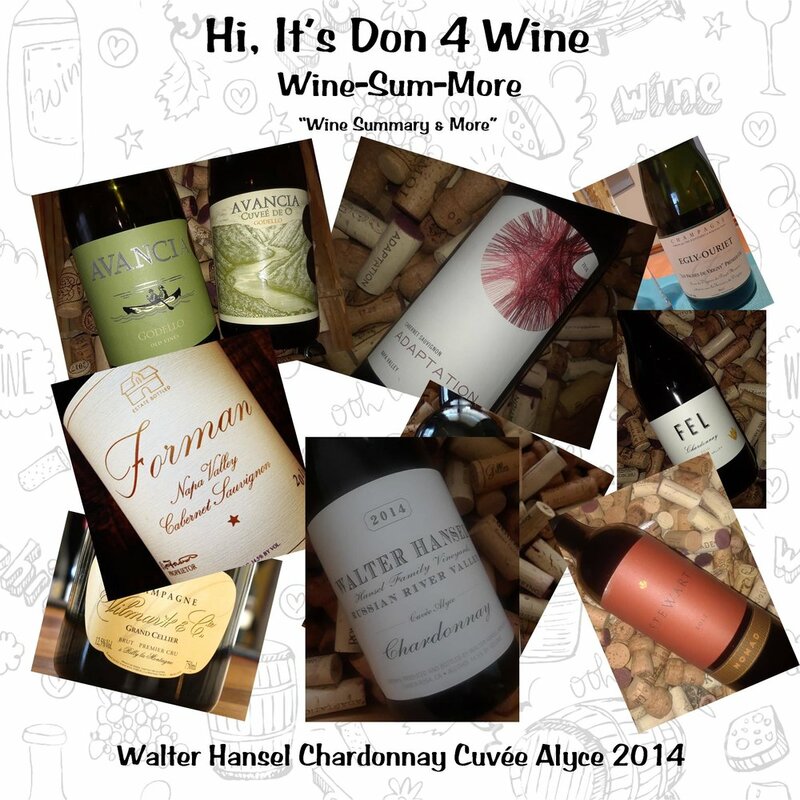 Hansel’s Cuvée Alyce wines (Chardonnay and Pinot Noir) are the benchmark for Walter Hansel. Named after his Mother (who wouldn’t make wines named after their Mother the best they can make?) the Chardonnay comes from small berries that are thinned in the vineyard from 12 to 15 times during the growing season to keep yields low and the quality high. Whole cluster fermented and using minimal French Oak aging gives the wine that subtle but beautiful balance. Priced around the mid 30 dollar range, this is a wine to be sought after, even the more recent vintages have excelled. This wine received a 95 Point review from Wine Advocate and 93 from Vinous Media. I gave it a strong 94!